I'm taking a little break from my usual programming to talk about something a little controversial at the moment - internships. Sparking into a bit of a hot topic in the media and twittersphere in the last few days, Fair Work Australia are cracking down on internships that might be deemed illegal if they're not conducted as part of an 'authorised educational training course'. Of course the topic is pretty close to my heart because at Ink & Spindle we engage interns on a fairly regular basis. Some of our interns are requesting a position as a compulsory part of their degree, others are coming to us entirely of their own volition. They might be a full-time parent looking to return to work, or a student who has studied something entirely different and now are curious about changing career paths... to us it doesn't matter what their background is so long as they're keen. 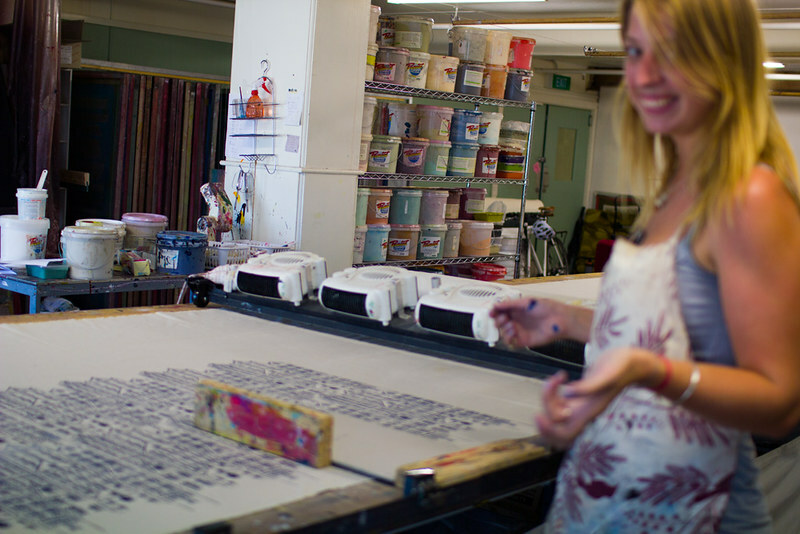 A very blurry Robyn, printing a single colour repeat design of dutch houses! I think that yes there are instances in certain industries where internships are exploitative - big companies offering long term positions when they could afford to pay someone but choose to substitute a paid position with a free intern. These situations are unethical and set a bad precedent in their industry. But there are other situations such as ours where we simply can't afford to pay an extra person. We aren't dependent on interns - our business functions fine without them - but if there are individuals keen for the experience we'll gladly take them on board. We might not have a lot of spare cash but we do have a wealth of knowledge to impart. There are a lot of menial tasks to be done around the studio but we try hard to ensure that the positions are mutually beneficial. I can't help but feel that the issue of unpaid internships is largely a 'first world problem' and seems to occur largely in 'desirable' industries, e.g. textiles, music, fashion, design. There seems to be an abundance of willing workers and not enough jobs for all of them. To me that's not just an issue of exploitation but equally an issue with our education system. Here we are providing an gamut of exciting higher educational opportunities, giving people the illusion that they can work in whatever field they desire, but without any accountability from our educators with regards to finding work in the chosen field after study. Textiles is a classic example. Perhaps it's my ignorance but sadly I just don't see where all the jobs are for the students who are studying textile design. Yet our universities keep producing new graduates; students who are passionate about design and are lead to believe there'll be work at the other end. And when there's not, it's no surprise they're willing to do unpaid work to give themselves an edge. In my opinion the best way to find work in our field is to make your own job. That's what we did. So when our interns come through we focus less on 'textile design' and more on 'small business' - how our business runs, how we make it work, the ups and downs and challenges. 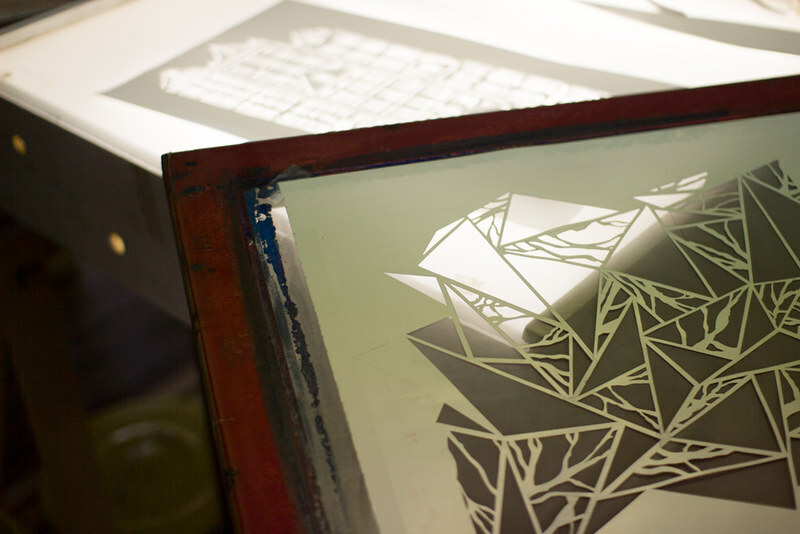 These are valuable insights for anyone, not just a student of textile design. Interestingly most of the successful creative individuals I've met are those who first studied something else entirely different. I think that's awesome. This issue of exploited interns is also gathering momentum here in the UK. I graduated from a textile degree in 2012 and have completed two very different unpaid internships. One was with a designer/maker which was a great insight into how to run your own business. There was a concious effort to repay my time with industry knowledge and a flexibility in working hours so I could have a part-time paid job. The other was the complete opposite where I was expected to create profitable designs for free 5 days per week without anything given back in terms of education or insight into the industry. I have to say, particularly as a mature graduate, it's very disheartening to see how nearly all entry level jobs are being advertised as unpaid internships. I don't know how people can expect graduates/current students to pay rent and expenses whilst working for free in London. Perhaps its important to add to the debate just how different work experience is from an internship. I find it disheartening to see internships on the rise as design, especially textile design, is so underappreciated and underpaid vs other industries. On job availability, I graduated from a BA in textile designer (1999) and have never had more than 6-8 unemployment. There are many many different career paths available. Several years ago i advertised a graduate roll in my team through RMIT (november) and received two applicants. 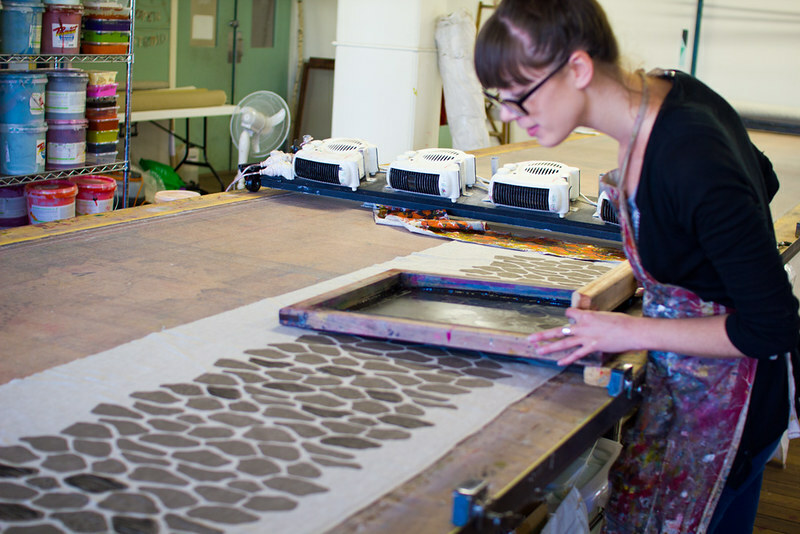 In fact, often roles are filled by non textile designers based on applications. I don't disagree with your post at all. Very much like other issues with businesses and ethics, the ones that practice unethically tend to ruin it for the small business that can benefit from interns. I know for me I was able have an internship and work two part time jobs without issue. I was even able to do some work outside the office and meet on my lighter days (which was usually Fridays). I know of other people's internships where they were simply an errand person or they did all this work for them only not to be able to use it in their portfolio. The question remains, is there a way to make internships fair so it's ethical and legal?